Panasonic Corporation and the UNESCO World Heritage Centre today announced a strategic partnership agreement to promote sustainable development through World Heritage conservation and environmental education for the next generation. The Fifteen Year Old Partnership Enters a Brand New Stage. Panasonic aims to be the "No. 1 Green Innovation Company in the Electronics Industry" by 2018, its 100th anniversary. By putting the environment at the core of every part of its business, Panasonic is combining its environmental contributions with business growth. 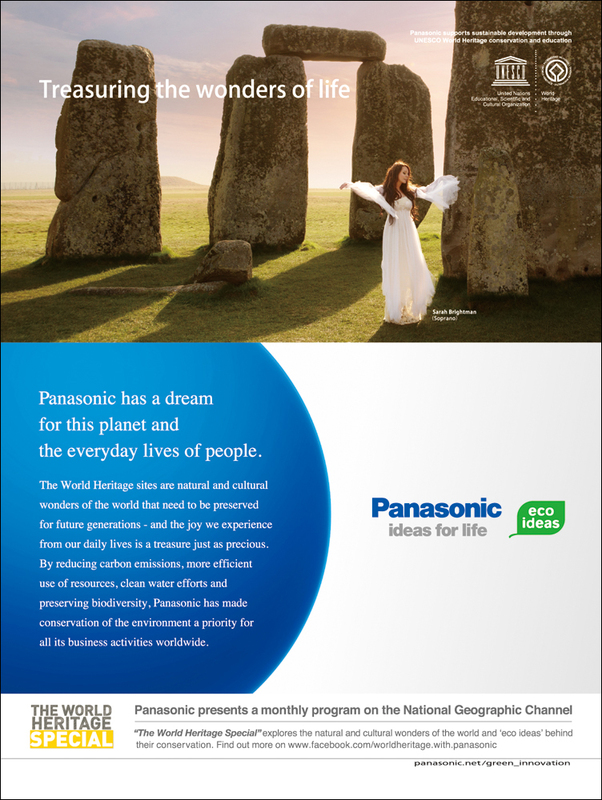 As part of its active contribution to environmental conservation, Panasonic has collaborated with the World Heritage Centre since 1995 to publish the World Heritage Calendar. The Centre is the Secretariat of the World Heritage Convention which leads the efforts to preserve cultural and natural heritage sites of outstanding universal value for future generations.The newly formed strategic partnership strengthens the relationship built on this successful collaboration over the years. "This new partnership with Panasonic will strengthen our ability to accomplish our mission," said Irina Bokova, UNESCO Director General. "It's an excellent example of the teamwork that is required to promote thinking and action for the sustainable use of the Earth's resources and environment." Under the two-year agreement commencing in June 2011, Panasonic will undertake communication and educational activities that promote the conservation of World Heritage sites and raise awareness of the 40th anniversary of the UNESCO World Heritage Convention in 2012. The activities include Panasonic's sole sponsorship of "The World Heritage Special" to be aired on the National Geographic Channel in 183 countries and areas, as well as educational initiatives for the next generation that involve the provision of Panasonic's 3D-related audio-visual equipment and technical support. Site visits and various contests for children will also be held, sharing the importance of conservation with younger generations through real-life experience. TV Commercials are now available in seven languages on Channel Panasonic. See more of our Promotion & Advertising commitments. Follow this partnership on the facebook page "The World Heritage with Panasonic", where you can learn more about the Heritages, review the TV program and share your own thoughts on environmental conservation. This video shows the excerpts from the press conference held at the Panasonic Center Tokyo. It will give you a glimpse of what this new partnership will be like.